Getting the right solution for your business has a major impact on ROI, but how much does the delivery method matter? A lot, according to new research from Aberdeen Group on the benefits of deploying a cloud-based workforce management solution. 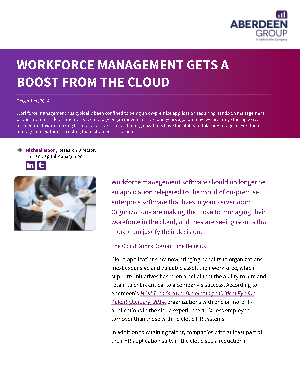 This paper—exclusively available from WorkForce Software—illustrates how opting for the cloud can get you even greater returns from workforce management technology. Learn about the cloud’s connections to employee retention rates, administrative costs, and maximizing revenues in this short and focused read.